I took my Mom’s Banana Bread recipe and turned it into an EASY Cinnamon Sugar Zucchini Banana Bread – this recipe was SO good and simple and it disappeared fast! It’s ZUCCHINI season! Do you have zucchini in your garden? I wish I could say I did. We used to plant vegetables and then a couple years ago things got busy in spring and we didn’t plant. Then the bed got overgrown…and now it’s gone altogether and there is new concrete in it’s place. No zucchini for me. 🙁 But luckily my grocery store has a bounty of it so I have 2 new zucchini recipes to share this week. Lucky YOU! Anyway, if you’re looking for a good book or show you must try it. Let me know what you think! 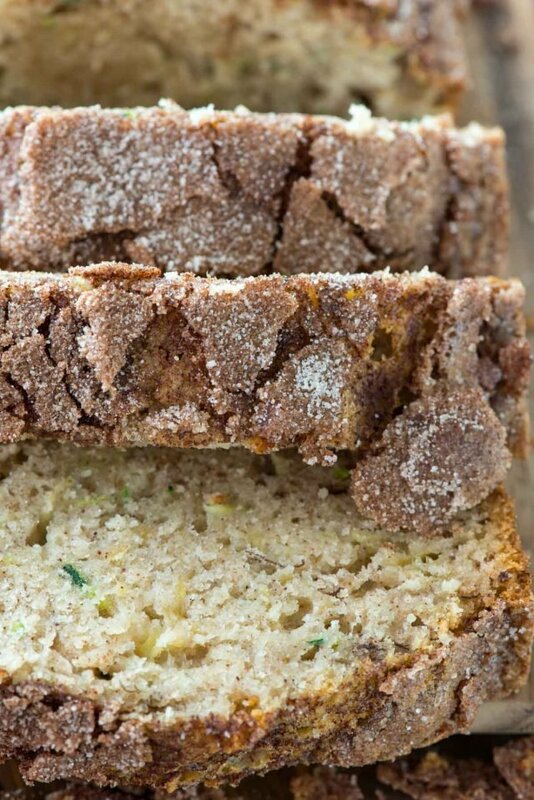 And while you’re watching it, inhale zucchini banana bread. Cinnamon sugar zucchini banana bread is so easy to make and delicious to eat. 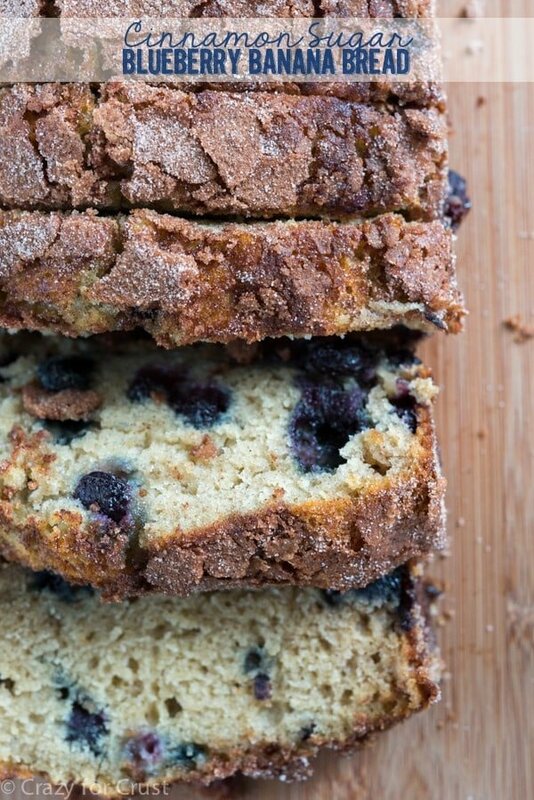 I started this recipe with my mom’s banana bread recipe and combined the idea of zucchini with my cinnamon sugar blueberry banana bread recipe. I love quick bread recipes – I have so many on this site and love each and every one. 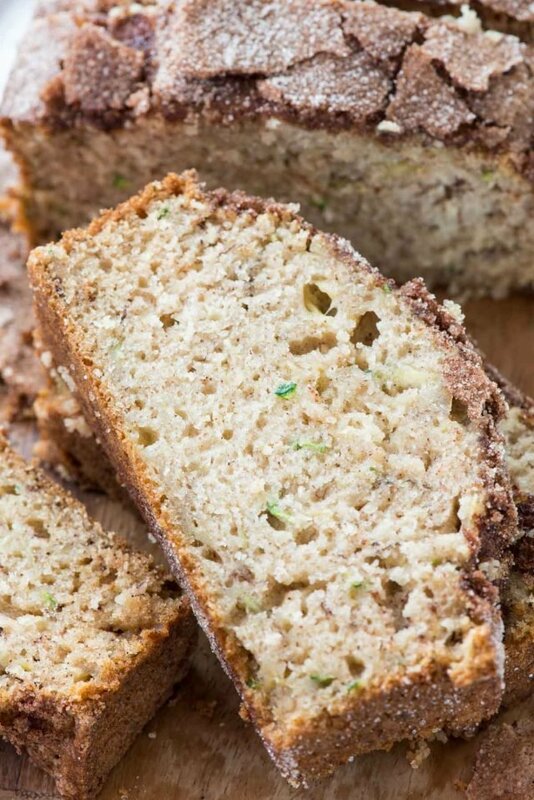 It was easy to switch my normal banana bread recipe to a zucchini banana bread: all I needed to do was reduce the banana and add shredded zucchini. 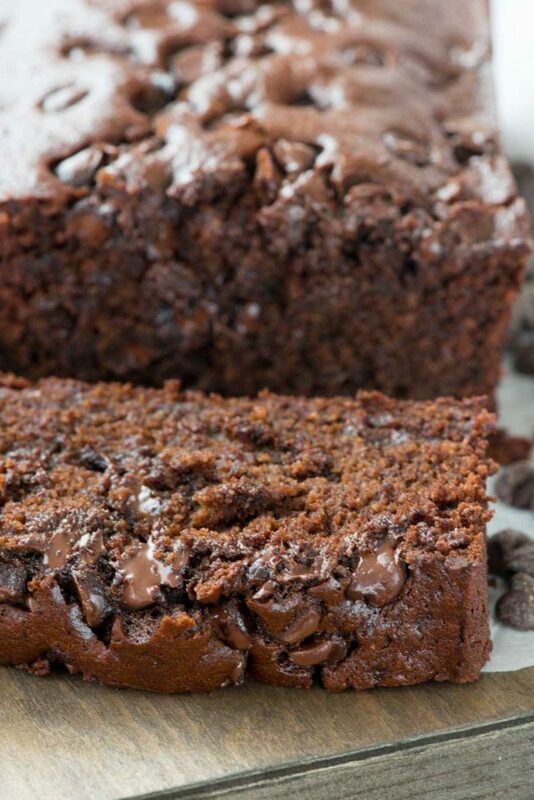 This results in a delightfully tasteful banana bread with a hint of zucchini. The zucchini is a vegetable which makes this bread a vegetable, yes? Plus the cinnamon sugar topping – that’s the best part. It gets crunchy in the oven and adds so much delicious flavor to the top of the bread. How to make the perfect zucchini banana bread? I like to use really overripe “tired” bananas. Did you know that when your bananas get spotty you can freeze them? I cleaned out my freezer the other day and found about 2 dozen frozen bananas. They turn brown, slimy and gross looking, but they work amazing in baked banana recipes. Just defrost before adding to the batter. I love using sour milk in my banana bread. This just means you need to add some vinegar to your milk beforehand, to make it “sour”. You can also use buttermilk instead, or if you can even use almond, coconut, or soy milk. In that case, just add vinegar to the mixture to help activate the baking soda. Shred your zucchini using a regular box grater. One small/medium is about 1 cup. Liberally sprinkle the top with cinnamon sugar – you won’t be sorry! This cinnamon sugar zucchini banana bread is the best banana bread recipe ever – and everyone loved it! Cinnamon Sugar Zucchini Banana Bread - an easy banana bread recipe with zucchini and a crunchy cinnamon sugar topping baked right in. 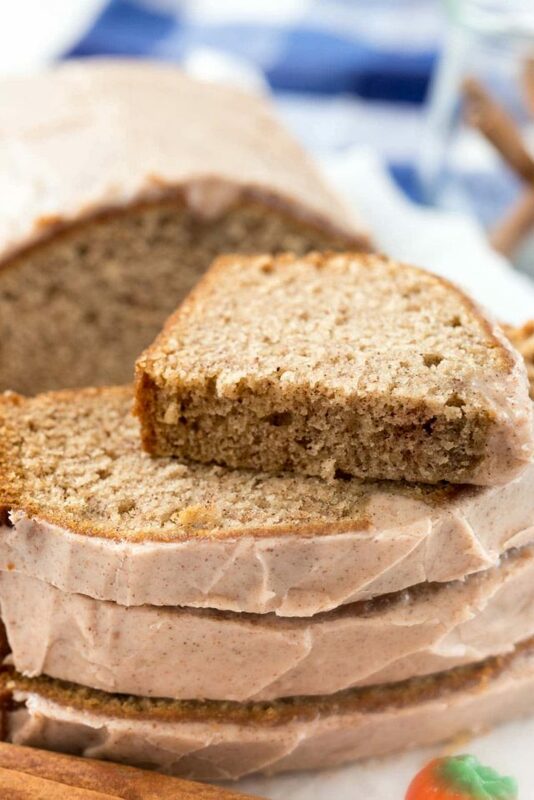 This is the perfect banana bread recipe! Mix in flour until just incorporated, then stir in zucchini. Pour into prepared pan. Combine 1/4 cup sugar and 1 teaspoon cinnamon in a small bowl. Sprinkle evenly over the top of the batter. Bake for 40-50 minutes3 until a toothpick comes out with just a few crumbs. The edges will be a dark brown and there will be a nice crack down the center. The cinnamon-sugar crust is your signature banana bread style and I love that you carried it over into this version! I would seriously eat the whole loaf because banana bread of any kind is my BFF! This sounds great; just like the rest of them! The recipe calls for oil but the directions say cream butter. Should it be butter instead of oil? When I first read A Handmaid’s Tale in high school I was so traumatized I actually had nightmares. Now that I’m older (not sure about being wiser), I want to read it again before watching the tv show. Some of us in Canada have a long weekend this weekend and I think baking cinnamon sugar zucchini banana bread and reading this book will be the perfect holiday Monday activity. Thanks for the inspiration Dorothy! This smells delicious but when I took it out of the oven, the cinnamon sugar topping hardened and separated from the bread. I only cooked for 40 minutes. Any idea where I went wrong? I’m sure we’ll still eat it up in the morning! Gotta be honest. I didn’t like this. I made it exactly to the recipe and I think the bread really lacks flavor. Maybe I should have used butter? But in reality I feel like it needed another 1/2-1c of brown sugar and more cinnamon. So-o-o…when do you add the salt? This is absolutely delicious. I love the crust! Best banana bread to date. I made a few changes, because we are gluten free, that I wanted to share. I did 1/4 cup sweet cream salted butter and 1/4 cup coconut oil instead of 1/2 cup vegetable oil. Only 1/2 cup sugar in the bread and for the topping, I split the 1/4 cup sugar between brown and regular (because come on). I added more salt bc I tasted batter and it needed some, so I added almost a tsp. I just regular milk (no buttermilk or vinegar) and then split the flour 1 cup King Arthur all purpose gluten free and 1 cup Pamela’s gluten free pancake & baking mix. Everything else I kept the same. Thanks for sharing! Love this recipe! I’ve made it twice now in less than a week! Did you peel the zucchini or drain the liquid from the zucchini? I am planning on making it today. Is it necessary to peel the zucchini and drain the liquid from the zucchini? I am assuming draining the liquid is not needed since it will lend moisture to the cake and I also see green specs in the pictures, so I think you did not peel the zucchini.